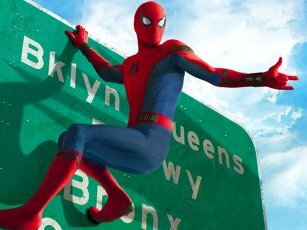 There are now six “Spider-Man” films, and this fresh, lighthearted ’80s-teen-films-inspired romp is better than 1, 3, 4 and 5. (But not combined. And no “Spider-Man” film may ever be better than Tobey Maguire’s “Spider-Man 2,” and Marvel Films has seemingly made peace with that reality.) And don’t be surprised that your opinion of Spidey’s high-tech, 2017 costume might be determined by how old you are. As the villain, superhero movie veteran Michael Keaton brings the amount of gravitas this film sometimes wants and needs. After the identity-discovering shocks of “Homecoming”‘s final scenes, it’s clear Zendaya is not the only one who is no longer undercover. And be sure to stay to the very end of the credits like the well-trained Pavlovian Marvel Films dogs we now are…..(heehee 🙂 ).